Showing 32 articles from March 31, 2014. SOUTH BEND – At the latest Local Board of Health and Pacific County Commissioners meeting held March 25, the agenda for the Board of Health paid out to the City of Raymond a $2,500 voucher for rainbow Valley Landfill. The meeting was then closed and the Commissioners moved onto the two page, 19 item, County Agenda. SOUTH BEND – Residential robbery, methamphetamine and DUI were the main focus of local law enforcement the past several days with the biggest case involvingMandy Carmen Mitchell, 35, formerly of Raymond, now residing in Aberdeen, and Jeffrey Lynn Hunter, 52, Grayland, who were arrested in connection with the Lebam residential burglary that took place last Thursday afternoon. The word is getting out and the community should be aware that Raymond now has the first no-kill animal shelter in north Pacific County. 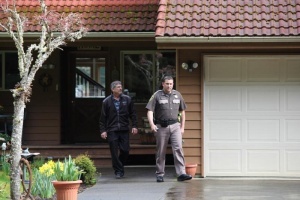 Photo by Scot Pearson Rob Friese walks out of his home with Chief Deputy Pat Matlock. Friese had come home to interrupt a home invasion; his wife was hiding in the woods and called for Rob to come home. LEBAM - For Lebam residents Rob and Lisa Friese the day started out normally but turned into a brazen daytime home burglary. Are you just dying to go shopping for a new dress? Can't wait to get out of town and visit memory lane? Then it’s time to play Remember When at the Raymond High School Reunion for all classes of the 1950s, 1960s and 1970s on April 26, 2014. Kate Moore (background) gave a presentation March 25 on how eating well can help you maintain energy and stave off disease during the first of multiple "Hungry for Change" lectures at the Winlock Timberland Library. It appears Vader will no longer have to cancel its May Day festival after volunteers have stepped forward to lead the event. 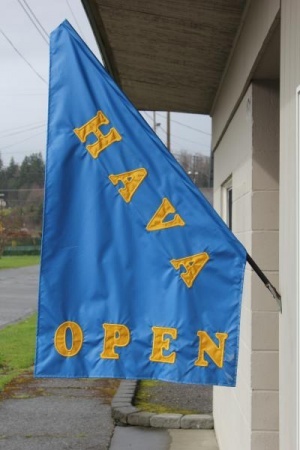 Though it had been reported Thursday by Mayor Ken Smith the festival was officially cancelled due to a lack of organizers, residents Janet Charlton and Judy Costello have since made themselves available to make sure May Day 2014 goes off without a hitch. The Castle Rock Senior Center is raffling off a pair of Heritage Mint Dolls, with proceeds benefiting ongoing senior center activities. Tickets are $1 each, or $5 for six, and two winners will be drawn during their April 18 potluck, to which the public is invited. For more information, call (360) 274-7502, or visit the center at 222 2nd Ave. SW (adjacent to City Hall) in order to enter. Area residents have expressed significant concerns for the cost of a proposed Toledo School District bond measure, though district officials say a bond is their only option to repair and upgrade their schools. Held March 18 as part of Vision: Toledo’s Big Community Meeting, a forum allowing district members to speak directly with Superintendent Sharon Bower laid bare the significant impact a bond could have on local taxpayers, as well as the potential consequences of not passing the measure. Toledo’s VFW Post 3429 has announced they will be closing due to significant decreases in participation, and will be turning in their charter at the end of next month. First mustered in 1934, the post had served for 80 years as a gathering place and source of philanthropy and service to veterans throughout Toledo, but has been unable to keep up their efforts due to both an aging population of members and decrease in community participation. The Winlock Timberland Library will be holding a poetry contest next month and writers of all ages are welcome to articipate. In celebration of April as National Poetry Month, entries will be accepted between April 1 and 15 in four age categories (19 and older, 13-18, 8-12, and 7 and under). Winners in each category will be selected by a panel of judges then published in a special issue of Town Crier. South Bend Timberland Library presents S.B.T.A.G. Teen Advisory Group, 3:30-5 p.m., April 4 for teens. Hi, this is Barb Lewis reporting on the book "Once We Were Brothers" by Ronald Balsom. As soon as I read the last sentence I knew this was the the one I wanted to tell people to read! Welcome to April and whatever it brings us, weather-wise. Definitely, the grasses are greener while deciduous trees, blooming plants and shrubs are all adding variety to our landscape almost daily. While rain is mostly overdue, the timing might mean that our hard dense clay soil won’t dry out enough for seeds to germinate. We never had much luck with early peas unless we pre-sprouted them. The Women’s Club is gearing up for their big Spring Garage Sale extravaganza. Contact Linda at (360) (360) 295-0875 or Patty at (360) 295-3544 if you have donations or can help before, during or after the Sale. Sale dates are April 25 & 26. Vision:Toledo Arts, Rec and Events reports great survey feedback at March BIG Community Meeting - support for a local library with TRL kiosk, walking trails, historical markers, more lighting around town, repainting water tank. Toledotel's Fiber To The Home (FTTH), new Valley View Health Clinic, school improvements and new waste-water treatment facility keep Toledo a great place to live, work and play. Heads up: newly formed v:T Business Group May 1 (rachel@phillippsins.com), Clean Up Day May 31 (mikes@toledotel.com), combined Riverfest and Steelhead Derby July 26 (rt.lovell@hotmail.com), August date TBA Movie in the Park (mike@morganartscentre.com). Next A.R.E meeting April 22. 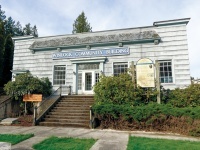 Visit www.morganartscentre.com or call (360) 864-4ART. Until just a few minutes before writing this column, the biggest news in Vader was the cancellation of May Day due to a lack of organizers for the event. However, the tough appear to have got going and it turns out May Day 2014 is still on through the efforts of coordinators Janet Charlton and Judy Costello, as well as a number of volunteers. 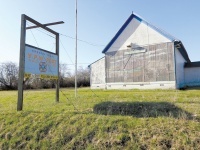 The theme this year is "A Blooming Good Time in Vader" and the festival, complete with a parade, carnival games and other attractions, is still scheduled for May 3. We’re all very grateful to Charlton, Costello and all the volunteers who make May Day—and Vader itself—happen. For more May Day information, contact Charlton at (360) 295-3011, and to sign up as a vendor contact Costello at (360) 295-3036. The other day I was watching a Prisoner of War show on the TV and I was reminded of Ed Leonard. Ed was a native Winlockian and on May 31, 1968, he was shot down over Laos, North Vietnam. He spent about five years as a POW, in conditions most of us could not endure. Then, in May of 1973, Ed was brought back to Winlock. I can still remember the big Christmas parade we had for him in May. Most importantly, the entire town turned out, even the schools were let out for the parade, it was a big deal! We were a proud town, our local boy was brought home and we were proud to celebrate his return. Winlock has always been a small town but a small town with a very BIG heart! Kyle Geiger, left, joined the Hearts in Motion medical mission in Guatemala. 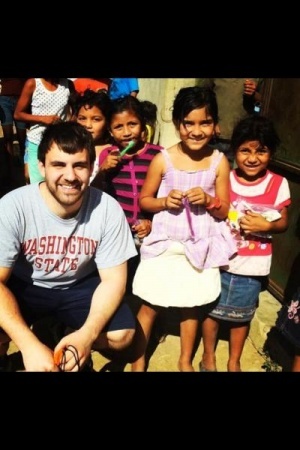 Kyle Geiger, a junior neuroscience & Premed major and Washington State University, recently joined the Hearts in Motion medical mission in Guatemala. Onalaska resident John Roe has informally announced his bid for a seat on the Lewis County Commission and has begun efforts to reach out to area voters in District 3. A former resident of Vader and graduate of Toledo High School, Roe spoke to voters Thursday during the Vader City Council meeting and said it is his desire to gain a seat on the Commission to serve his fellow Lewis County residents, after having tried unsuccessfully to do so back in 1994. Castle Rock Mayor Paul Helenberg was formally admonished by the City Council on March 24 after having made disparaging remarks toward Police Chief Bob Heuer during a previous council meeting. The remarks had come about after Heuer presented a request for a $10,000 budget amendment transferring funds to the Police Department to cover unexpected expenditures at the end of last year. The Vader City Council elected to maintain their temporary ban against medical and recreational marijuana facilities on Thursday, pending further changes in state law. First passed Jan. 23, the six-month ban prohibits the establishment of any facilities used for the production, processing or sale of recreational and/or medical marijuana, and was intended to allow officials time to examine and respond to rapidly-changing state policy, as well as reconcile federal criminalization of the substance. Winlock officials have stated they are intending to lease or sell the Community Building in an effort to relieve the city from paying for utilities and regular upkeep. 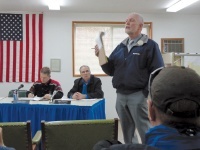 Discussed during the March 24 Winlock City Council meeting, Mayor Lonnie J. Dowell said the council is being asked to consider either leasing the building to the Winlock Lions Club, or seeking a sale on the open market. Valley's Nick Betrozoff shot a 39 to win medalist honors. 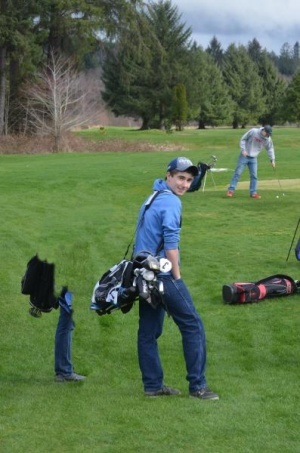 Willapa Valley (191) defeated Northwest Christian (210) and Wahkiakum (218) in boys score as medalist Nicholas Betrozoff shot a nice round of 39 to lead the victory. The match was played in very wet conditions at at Hawks Prairie in Lacey last Thursday. With most sports rained out this week, track & field and soccer had the limelight with several promising local athletes beginning their quest for individual greatness. The Winlock, Toledo and Castle Rock programs had rare meetings as CR joined in a meet that included Winlock at Toutle Lake on Thursday, then Toledo joined Winlock in the Lewis County Invitational on Saturday. A rundown of recent local games from the week of March 24. A Winlock woman was sentenced to four years in prison March 26 for the theft of thousands in cash and lottery tickets from a Toledo gas station, according to Lewis County Superior Court. Katrina M. Bowen, 37, had been charged Jan. 22 with first-degree theft after stealing an estimated $178,000 in scratch-it tickets, as well as cash used to pay for beer purchases, from the Flying K gas station, in Toledo, where she had worked as a cashier until last September. Castle Rock has honored outgoing Cadet Sgt. Mike Delzell for his years of participation in the city’s Cadet Program, as well as his outstanding character and attitude. 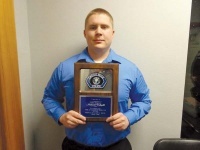 Presented with the Service Award during the March 24 Castle Rock City Council meeting, Delzell has been one of a number of young individuals involved in the Cadet Program, which allows those seeking careers in law enforcement to interact and train with officers within the department. Defective equipment has been blamed for a rollover collision on I-5 in Castle Rock March 25, according to the Washington State Patrol. Local EMS and fire calls between March 24 and March 30.